At any rate, I contacted a trainer friend of mine, and started contacting rescue services in Washington state, of which there are not very many. I told SCRAPS please do not put that dog down, he is obviously a well bred dog, and someone will want him. He said, he was found wandering. If my Rottweiler was gone 5 minutes I would have a heart attack. The trainer told me, they will give that dog to someone with an apartment. This is outrageous to me. If you feel you can find a good home that will appreciate the wonder that a Rottweiler is, please contact SCRAPS at get him out of there. that link is his picture, and his number. I sincerely am concerned for this dog. I rarely check these sites and certainly do not expect to find dogs this well cared for not picked up already by a rescue service. Join in and write your own page! It's easy to do. How? 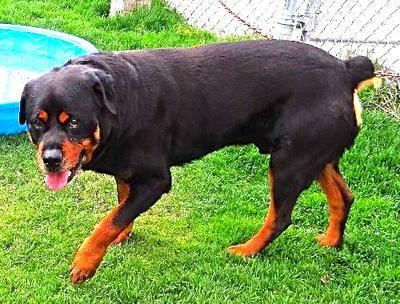 Simply click here to return to Available Rottweiler Rescues.